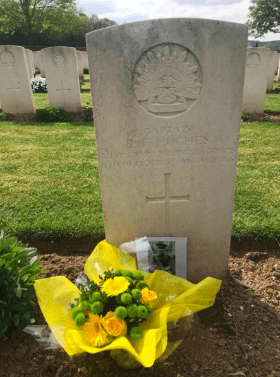 On the eve of Anzac Day, Australian prime minister Malcolm Turnbull officially opened the Sir John Monash Centre at Villers-Bretonneux France. The day marked 100 years since the Australian general, after whom the Centre is named, lead his Australian troops first of a series in successful battles in WWI. 46,000 Australians met their deaths fighting on the Western Front. The Prime Minister said that Monash and other Jewish members of the military attended a service at the St Kilda Synagogue before leaving for Europe in 1914. Malcolm Turnbull told of his personal links to the Western Front. He said: “This afternoon Lucy and I stopped the cemetery at Amiens station at the grave of Lucy’s great uncle, Roger Forrest Hughes. Newly married, a young doctor, and a resident, at St Vincent’s Hospital, Roger enlisted in the AIF in 1916. Within five days of arriving on banks of the River Somme he was hit by a shell while treating a wounded digger. Roger died at the age of 26 in the arms of his brother, Lucy’s grandfather, the fighter ace Flt Lt Geoffrey Hughes whose squadron was nearby. Referring to Monash, Malcolm Turnbull said: “German commander Erich Ludendorff launched a massive Spring Offensive on 21st March to break the allied lines. And one allied defeat and retreat after another followed. Churchill described the offensive as ‘the mightiest military conception and the most terrific onslaught which the annals of war record’. On their second attempt the Germans captured Villers-Bretonneux on 24th April, but in an assault which Sir John Monash later described as “the real turning point of the war” the 13th and 15th Australian Brigades recaptured the town in the early hours of ANZAC Day 1918 and ensured the Germans could not achieve their objective, the capture of Amiens and its vital railway hub. Monash did the meticulous planning, Brigadier General Pompey Elliott worked with instinct and passion, and together they launched the brilliant and ruthless counter attack that broke the German onslaught and helped to turn the tide of Europe’s deadliest war. From here, it seems there was nothing Monash could not do. In May 1918 he was given command of the entire Australian Corps – the first time they had been led by an Australian. Monash was above all a modern man, an engineer, legally trained, a lateral, creative thinker – as literate as he was numerate. Before the War he made a fortune deploying the latest Monier system of reinforced concrete construction. We see him in his khakis bewhiskered and stern as Generals were, but to think of Monash in our time, think of a man at the cutting edge of technology, pushing the boundaries of imagination and innovation. Every one of his men knew exactly where they were going, who they would encounter and what they must achieve and he knew everything depended on them, they were his mates, and so he made sure they had hot meals, dry clothes and were rotated out of the front to recuperate as often as possible. He pioneered aerial supply drops, and air reconnaissance in near-real time, he showed how to use the trench-busting power of armoured tanks. In short, he revolutionised warfare on the Western Front. On the 4th July 1918, Monash led Australian and American infantry in what was then the most sophisticated joint operation in history involving air drops, artillery and a line of British tanks in the battle of Hamel. He planned to take the village in 90 minutes – but was famously three minutes late. That victory put the German army on the defensive right up until Armistice Day. And from that time on Australians and Americans have fought side by side in every major conflict. In August, King George V came to the Somme and knighted Monash in the field surrounded by his troops and captured trophies of war. By the end of the war there was no-one who doubted his battlefield prowess. Britain’s Field Marshal Bernard Montgomery later judged Monash to be “the best general on the Western Front in Europe”. Montgomery said “the war might have been won sooner, and certainly with fewer casualties” if Monash had been in command of the British armies as well. That’s why we are naming this Centre after Sir John Monash – but it is a memorial to all the Australians who served in this terrible war – from the private soldiers like my grandfather Fred Turnbull, to our greatest General. Before Monash boarded his transport ship in December 1914 he and 80 other Jewish military men crowded into the St Kilda Synagogue. They prayed for King and country. But they did so within a framework of universal principles which we recognise today. 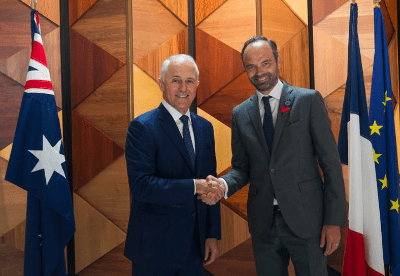 Later at a media conference Turnbull was asked why he decided not to entertain a rise in rank for Sir John Monash posthumously promoting him to field marshal. Well I think we’ve paid immense and appropriate honour and recognition to Sir John Monash, not least yesterday in opening the of the museum at the Australian National Memorial named after Sir John Monash. He responded: “Now he was a lieutenant-general the appropriate rank as commander of a corps. After the war he was promoted to general, to a four star general. So his honours have been immense and Monash’s story is there it is told it is one to be written about and commented on. According to recent media reports this new facility has had a poor attendance record so far. However it is Winter (14 Dec 18) in France which may have an effect on attendance. This battle was fought and won involving two Australian Brigades commanded by Brig Glasgow and Brig Gen Elliot. Monash was not present during this battle.